The United Nations is mourning the death of former Secretary-General Kofi Annan, who passed away peacefully after a short illness, on Saturday, August 18 2018. The renowned Ghananian diplomat was 80-year-old. 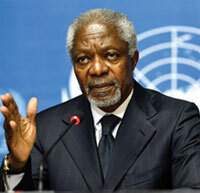 “Like so many, I was proud to call Kofi Annan a good friend and mentor. I was deeply honored by his trust in selecting me to serve as UN High Commissioner for Refugees under his leadership. He remained someone I could always turn to for counsel and wisdom — and I know I was not alone,” Mr. Guterres said in a statement.